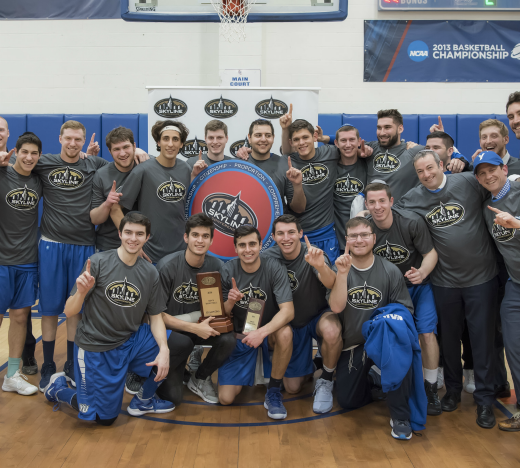 The Yeshiva University Maccabees (18-10) made history on Sunday, winning their first-ever Skyline Conference Championship and punching their ticket to the NCAA Division III men’s basketball tournament. Watch live as they battle York College at 1 p.m. on Friday; if they win, they’ll advance to the next round at 8:3o p.m. on Saturday, March 3. The No. 4 seeded Maccabees defeated No. 2 seed Purchase College at the Purchase College Gymnasium by the score of 87-81. Along their Cinderella run, YU had to overcome a 17-point deficit to knock off Mount Saint Mary College, as well as the defending conference champions No. 1 Farmingdale State. The win is the Maccabees’ 18th of the season, setting another program record in a season that has broken them again and again.